Config files (web.config, app.config) are a great way to store configuration settings outside of your programs’ code. If the configuration changes (for example you move from development to test or from test to production) you do not need to go and change your code and re-compile. You simply change the config file and you are good to go. In SQL CLR you can also use this concept, however there are some gotcha’s. First create your SQL Server CLR project. Note that you will have to have the correct versions of SQL Server Data Tools. You can download what you need from here: http://msdn.microsoft.com/en-us/data/hh297027. I have SQL 2012 installed and am using Visual Studio 2012, so I installed the SQL Server Data Tools for Visual Studio 2012 from the link above. To start create a new database project and add a new SQL CLR C# User Defined Function (you can also use VB if you like). Add a reference to System.Configuration to your project. Make sure you include the following line in your cs file: ‘using System.Configuration;’. Of course you can specify anything you want in the config file. To keep things simple I chose only to configure a sample connection string. In your cs file all you need to do is create a function that retrieves your configuration for the config file (in my case just the connection string). As you can see this code retrieves the value of the configuration value MyConnString from the config file. This is unlike normal .NET applications where configuration file changes take effect immediately. Be sure to execute this against the database you deployed to. 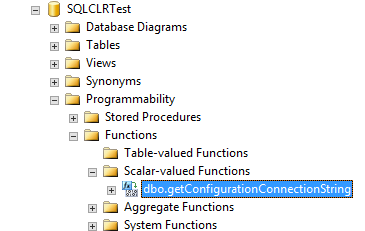 There you have it: you can now use configuration files from SQL Server CLR.